Sometimes we face the question of anonymity on the Web. There are many different ways to hide your real IP address by introducing yourself as a user of another country. Then, VPN will help, but inexperienced gadget owners will hardly want to mess around with the settings. In this case, it will be much easier to download a special application, with which you can “move” to another country in one click. 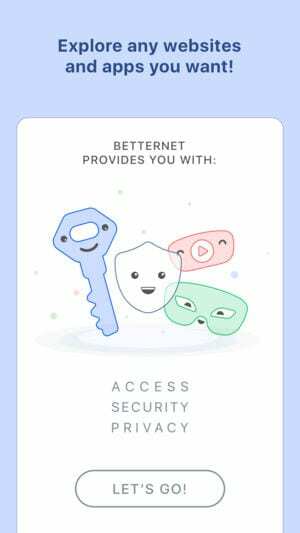 Betternet Hotspot VPN & Private Browser is a useful application designed to help you keep anonymity on the Internet and bypass locks with one touch. 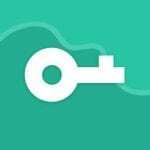 Betternet is the best free VPN proxy (VPN is a virtual private network). With it, you can bypass the state censorship, as well as visit sites blocked by the provider, employer or administration of your school. The software algorithm hides your real IP address and location, preventing the control of your network activity. In addition, Betternet uses an encryption algorithm for Internet traffic, which allows you to protect your device from unauthorized access and phishing attacks while you are using unprotected public Wi-Fi. Betternet is installed quite easily. To do this, you need to: download the application, run it, click on “Allow”, then click on “Install profile”. After installing, we will see VPN settings, where we click on “Add VPN configuration“. The “VPN” icon appears at the top, what means that all information sent and received by you will pass through the proxy server in an encrypted form. And if even someone intercepts your information, he will not be able to decipher it. The program provides a good speed Internet connection (if compared with other VPN-services). Its free version will provide you with all the necessary functions. In the free version of the application, there is some advertising. Premium subscription doesn’t contain any ads and has several useful features. 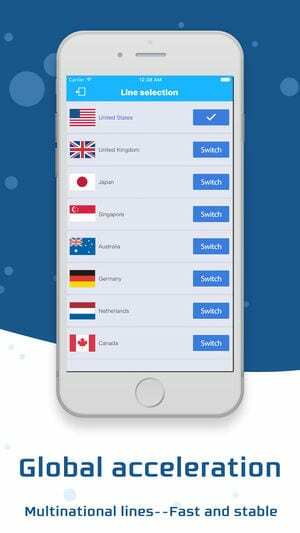 Opera Free VPN: Unlimited VPN is a fast and free VPN service that will protect you from snooping on the network and advertising, as well as help you deal with locks. Opera VPN hides your physical location, replacing it with virtual locations around the world. This will allow you to bypass the locks and censorship on the Internet and freely visit all the sites and social networks you need. The program also encrypts the connection, providing you with protection against threats and allowing to use any public Wi-Fi network without fear. Use the Internet in cafes, shopping centers or at the stops. Now no rascal or intruder can harm your device. 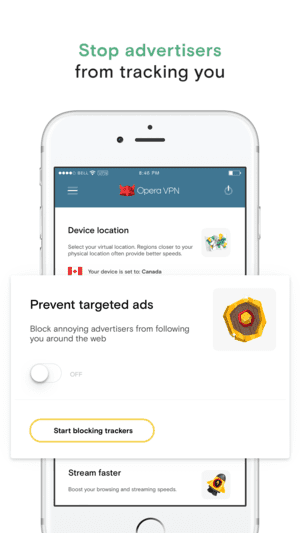 Also, Opera VPN does not allow advertisers to track your location with a built-in blocking of trackers. 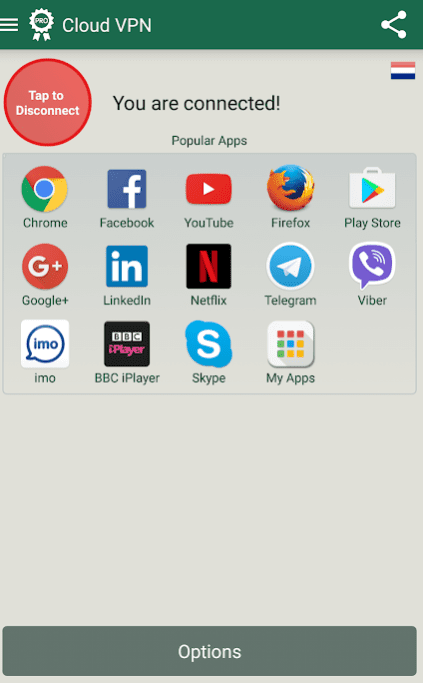 Let’s note one huge advantage of Opera VPN – completely unlimited traffic. Other applications usually offer a limited free packet of traffic – 500 or 250 MB per month. 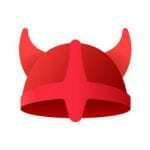 It is also worth noting that there are a couple of shortcomings of the Opera VPN application – this is the presence of advertising and the possible slowdown when downloading the company’s servers. However, the last drawback is inherent in all VPN services. The fast, secure and free internet is always with you, anywhere and anytime. *Update: The service is about to get closed. You can download it though just for a short time. 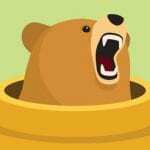 TunnelBear VPN program is a VPN service for Android, which will help you bypass blocking and censorship on the Internet. TunnelBear will hide your true location from prying eyes, saving you from restrictions and surveillance. You can freely visit the usual resources and sites that are prohibited by censorship or blocked by the provider. You will be able to choose a part of the world from which you will be online today, and take advantage of the country, the address of which you are using. The program will help you avoid tracking your physical location by IP address. Also, TunnelBear can protect your Internet connection while using public Wi-Fi networks in shopping malls and cafes. Even a child can understand the program. After the launch, you will be offered to log in (or create an account), and then a map will be displayed. It should be noted that it looks interesting. You select a country from the list below (or directly on the map) and then simply switch the toggle from the top to the active position. No additional manipulation is necessary. The application will do everything for you. The application boasts not only a nice interface but also an amusing visualization of Internet tunnels, through which all data is transmitted. After the activation of the VPN, you are invited to enjoy the animation – a hardworking tunnel bear as if digging a tunnel to the selected country, where the hole appears, from which it appears, joyful that the connection is made. An arc of zeros and ones indicates the connection activity. 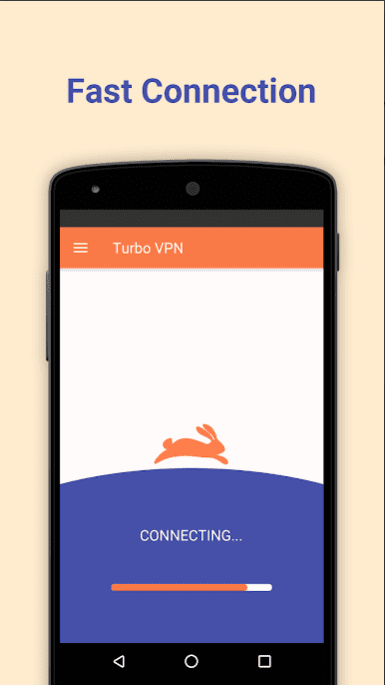 Turbo VPN is intended to protect your personal data and forget about blocked sites. This is a free application for accessing the Internet through a VPN. It will work with almost any phone or tablet, even the oldest models. Surfing the Internet through VPN has long been popular with many users. This technology provides additional encryption of the Internet connection over the standard one. 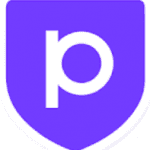 VPN provides protection from the interception of authorization data when going online via public Wi-Fi, provides complete anonymity on the Internet and allows you to bypass the blocking of various sites, including torrents and other “prohibited” resources. Begin to enjoy all the advantages of a VPN connection right now. 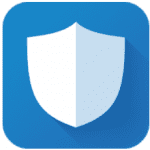 The application provides an unlimited number of free VPN clients, allows you to quickly, simply and stably bypass the blocking of Internet resources and secure personal data while surfing the Internet. The application provides a stable connection speed due to the many free cloud proxy servers. VPN-connection works fine with WiFi, LTE, 3G on most mobile devices. 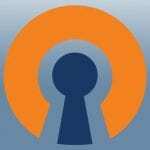 Bypass one-touch firewalls and provide complete anonymity on the Internet with OpenVPN (UDP / TCP) encryption protocols. What about the application as a whole? It is made very well, both in design and in everything else. Yes, there are hang-ups, but it happens quite rarely, mostly in the evenings of the weekend. Advertising isn’t irritating, it appears only when the program is installed or opened. Let’s be honest – such a high rating of users justifies itself. First of all, it should be noted that VPN Proxy Master is a very convenient and simple application. To gain access to the proxy server, you do not need to be an expert and make complex settings. Download the program, do a few clicks and VPN Master works. No need to register, enter login or password, everything is as simple as possible. These parameters do not affect the throughput. Watch online videos bypassing the lock! The application itself chooses a proxy server that is most suitable for your geolocation, but if you are not satisfied with the speed of the Internet, you can go to the list of servers in America, Europe or Asia and choose the connection yourself. The list of free VPN servers is updated every day. Now you can go to any encrypted sites around the world. Use a proxy server to bypass the blocking of web portals and applications, if you suddenly see a message that this video is not available in your country. Bypass firewalls of school or working WiFi, connect to the Internet through an access point, browse sites in anonymous mode, hide your IP and enjoy frequent browsing. 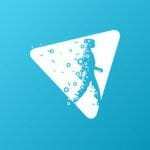 VPN Master creates unique tunneling channels for each user, protected from interference by the third party – this technology will keep the location of a user unknown, and encrypts incoming/outgoing traffic – a user history. The application guarantees complete confidentiality and protection of personal data. 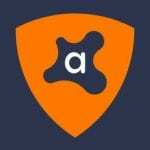 VPN Proxy by Avast SecureLine is a secure, anonymous and fast proxy widget that will unlock closed sites and applications and turn the Internet in incognito mode! The application protects about 400 million devices around the world, making it the number 1 program on the market. Why is the utility the best? It works fast and reliably, covers most servers around the world and provides high-quality service. 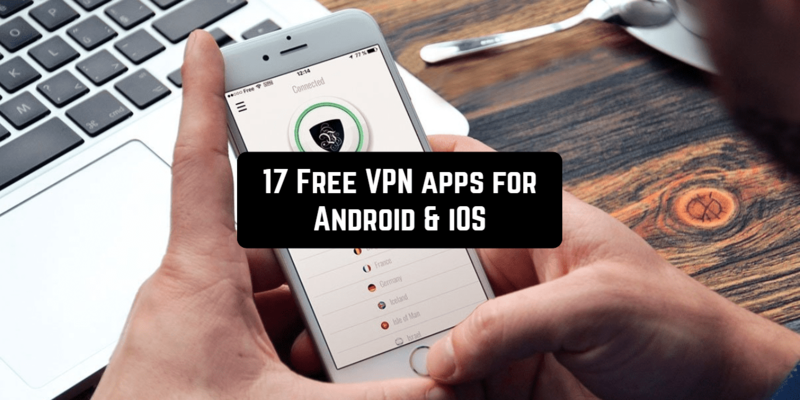 Use as many VPNs as you need without limits. To connect to a different location, select the location of the VPN server in the drop-down menu next to the Connect button and click Connect. Start using with the help of one button and become a member of a huge community trusted by millions of users. 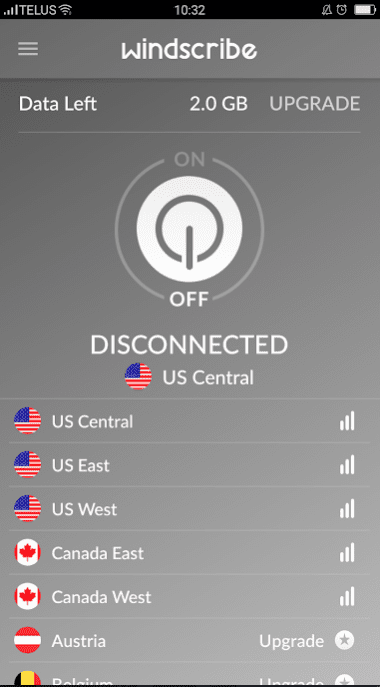 Change the location, connect to servers in 22 countries of the world, enjoy a continuous connection. 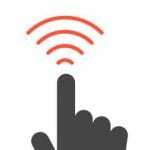 The application will automatically connect to the server when switching from mobile data to WiFi. With this easy-to-use and customizable application, you can ensure the complete confidentiality of personal data on the World Wide Web. 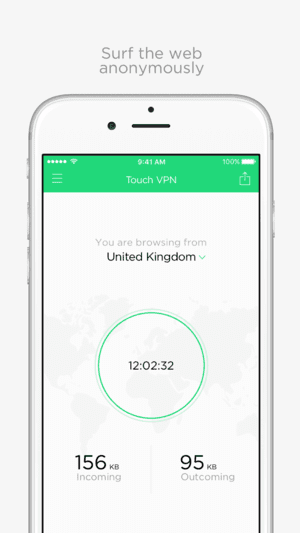 Touch VPN: Free Unlimited VPN Proxy and WiFi Privacy – the application allows to use the most secure type of connection absolutely free. Forget about leaking personal data with SSL encryption. Do you have to use “blocked” sites and applications? Worried about privacy while surfing the Internet? These and many other problems are solved by VPN-connection in recent years. VPN is decrypted and translated as a virtual private network. When the browser starts, it makes a secure connection to a foreign server. Since all received and transmitted data is encrypted via SSL, they cannot be filtered or blocked, what makes it easy to bypass regional prohibitions on various web resources. Proxy connections are often used for similar purposes. Its disadvantage is that it is completely based on browser technology, unlike a VPN connection, in which all traffic is encrypted and greater freedom for the user and security in the network are provided. Access to any website from any country, complete protection of personal data from hackers during the use of public networks, anonymity on the Internet and many VPN servers will be available in one touch – you just need to install the application. 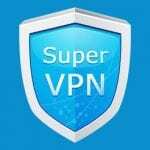 SuperVPN is a free VPN client. Just one touch to connect and you get unlimited bandwidth! 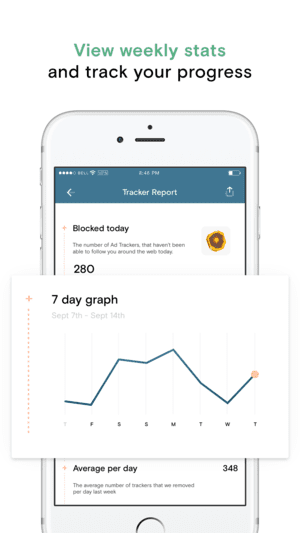 The application will protect your personal data by blocking the tracking of your devices by third parties. You will be able to unlock geographically restricted sites without registration and special settings. Just tap on the button “Connect”and you will automatically change your location to one of the specified regions. If you want a server in a particular country, then this is possible. Just one click and connect to the VPN, no root access is required. You can activate the VPN without the need for superuser permissions, it’s something that is really unusual for applications of this kind. The connection speed through this VPN remains high enough, so you do not even notice a big difference. But at the same time, you can get access to the resources and services banned in your region, and also not to worry that your personal data can be intercepted by intruders. The program encrypts traffic, connects to top servers and ensures complete connection security. The downloaded version works for 20 days, after this period, the utility can be used 60 minutes a day. After the end of the session, just turn it on again and work in a new session. No restrictions when visiting sites. 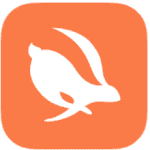 OpenVPN Connect is a full-featured VPN client. The application is not inferior to the full-scale version of the program. The tool allows you to manage virtual private networks and Android-devices. Simply transfer the configuration file using an external memory card, a link in the browser or an access server. A special feature of the program is the control over the charge of the battery. The utility turns the phone into a low power consumption mode each time the display is turned off or there are problems with the connection. Additional features include the use of the PolarSSL library, support for the IPV6 protocol and compatibility with the Android Keychain. Also, we want to note that the application doesn’t require you to root. There are several paid solutions in the form of special services, but there is also a more economical option. In order to start the work of the tool, you need to make some simple manipulations. Go to the OpenVPN menu and import a file with the resolution .ovpn. Now the mobile program will be able to create a new profile that will help you connect to the changed VPN. You just need to press the Connect button and go to the previously restricted page. 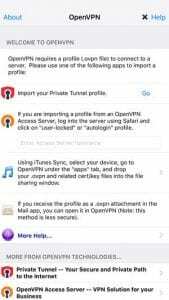 OpenVPN Connect is a very useful tool for all OpenVPN users who want to always have a mobile version of the application with them. hide.me VPN is a client of the popular VPN service, which makes it possible to use a fast virtual network for free. However, the service works according to the subscription model, so users who do not subscribe are subject to strict restrictions on the amount of traffic consumed and the list of available countries is greatly reduced. With a subscription, you can connect to servers in more than fifty countries and “surf” without any restrictions. The process of a connection to a virtual network is as simple as possible. 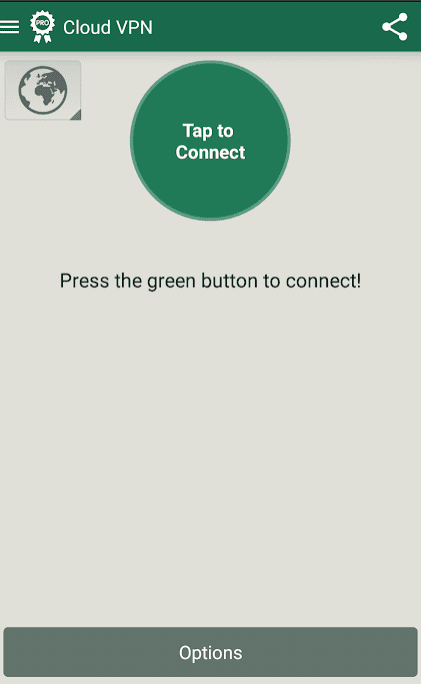 To become anonymous and secure on the network, just move the switch on the main screen to the “Connect” position. Restarting the browser and other programs working with the network is not required. Next to the switch, you will find the server country selection menu. Countries not available in your tariff plan are highlighted in gray. If you do not care about the server’s location, you can use the “Auto” mode. In this case, hide.me VPN will automatically select the appropriate network based on speed and stability reasons. In the settings section, you can enable the option to automatically connect to the server each time you start. This will help not to forget to become anonymous on the network and not to show your real IP. For the same purposes, the hide.me VPN provides an auto-shutdown feature that works every time the client “doubts” the user’s security. Also, it blocks all outgoing traffic when connections are disconnected. 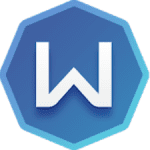 Windscribe VPN is a lightweight application that allows you to absolutely anonymously visit pages on the Internet without the risk of tracking ad units. Protection is provided by using an encrypted tunnel. The application comes with a convenient and modern interface, which is distinguished by a thoughtful structure and intuition. 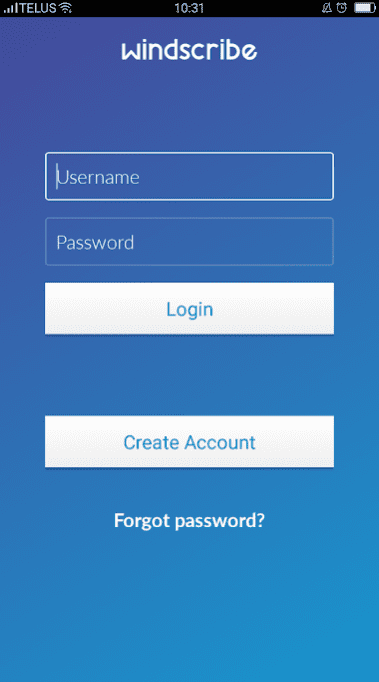 To start the work it is enough to select the desired server, and Windscribe VPN will automatically create an encrypted connection that will ensure anonymity and confidentiality during surfing. 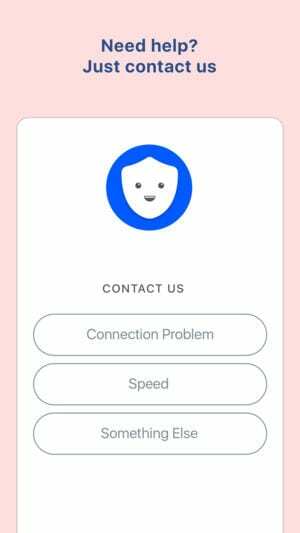 The application has a built-in firewall function that allows you to disconnect all connections that are not installed through the VPN. Thus, Windscribe VPN provides an additional level of protection, preventing the leakage of your real IP address. The feature will be very useful when you restart your device or when a Wi-Fi connection suddenly fails. The main advantage of this service is 10 GB of free traffic per month and the ability to access the Internet through the servers of eight countries. No personal data is required for registration, the service requests only the login and password. If desired, you can specify your email to access your account if you lose your password. As a cherry on the cake in Windscribe, there is a built-in ad blocker and a firewall. The free version allows you to use the service only on one device. 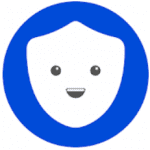 Hola Privacy VPN App & Browser is a popular solution that opens blocked sites, allows you to communicate anonymously in browsers and provides unlimited VPN. At the same time, the app works by exchanging the free resources of its users for the benefit of all. Also, we are promised some kind of innovative p2p-network, acceleration of surfing by choosing the nearest fast sources. Accelerate the loading of web pages. You can also create a favorite list, activate Unblocker. By the way, a link to an interesting foreign website can be easily shared with a friend in all ways available to you. You can easily disable/enable the definition of your location. You can set a password, clear the cache, history, and cookies. In this case, you can turn off images, pop-up windows, select the font size. In general, the full settings that are inherent in any self-respecting browser. 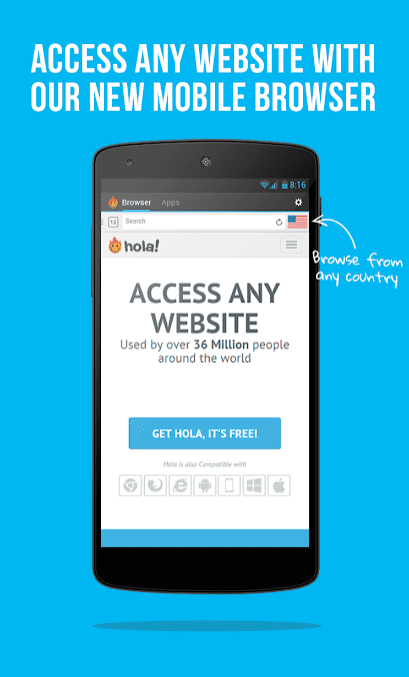 Hola definitely deserves attention, since it is not just a VPN client, but a whole surfing engine on the Web. 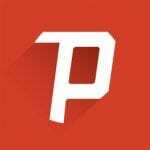 Psiphon Pro – get unprecedented access to your favorite news channels, broadcasts, and social media platforms! The application will protect the connection by creating a private tunnel between the device and the Internet. 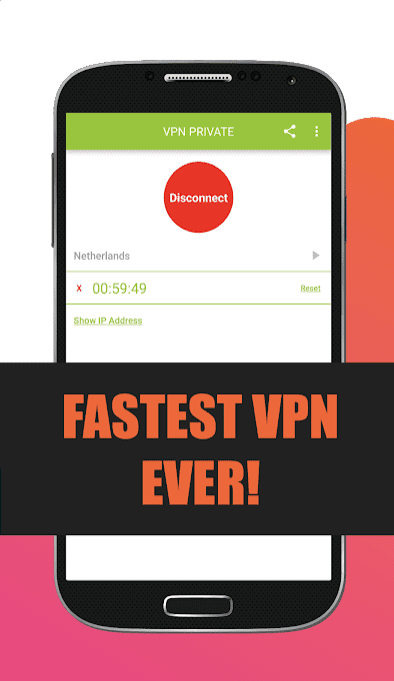 This is the best VPN tool for accessing interesting channels on the network. A special feature of the program is the connection to a global network consisting of thousands of servers. Registration in the program is not required, just download it and connect for free. The utility offers an unlimited connection through the global network Psiphon. Look at the statistics, select the applications that need to be excluded from the VPN tunnel, use open source code that is trustworthy. To delete ads, you must pay an annual subscription fee. 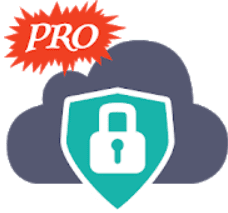 Cloud VPN is a useful service which promises to be completely unlimited and completely free. In this case, the application does not require registration, root-rights. Without the need for root-rights. Cloud VPN has a nice looking green interface with large control keys. In the left corner – the ability to select the required server. You can use the automatic mode or choose from four countries – France, Canada, the States and the United Kingdom. Cloud VPN showed the best results, both among eminent competitors, and not very much. Easy to manage, really working application. 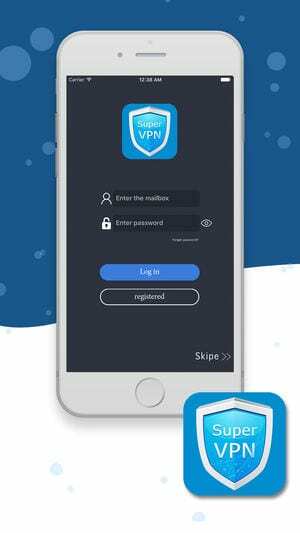 Protect Free VPN + Data Manager – download the application and start using a secure VPN connection, and monitor traffic with a convenient data manager. The application Protect Free VPN + Data Manager is a symbiosis of two applications at the same time – VPN client and traffic control. Thanks to Protect function, you can easily protect your personal information, passwords, and accounts. 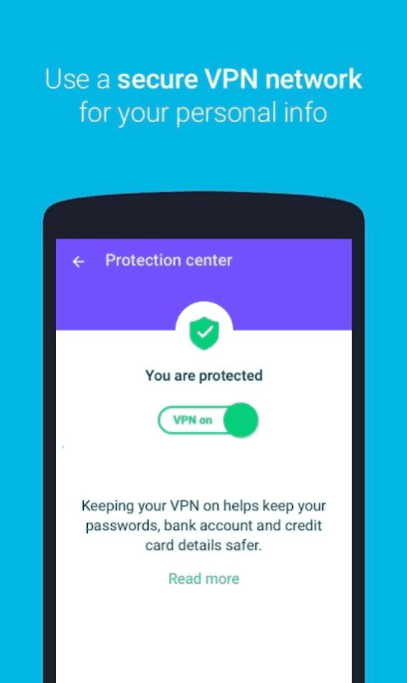 You can activate VPN with just one touch to the screen, what will ensure reliable protection of transmitted information even in public networks. At the same time, encryption of data will not reduce the speed of your gadget. The application alerts about any programs on the device that actively use mobile data, and allows you to use the network through a VPN protocol to maximize the security of your personal information. 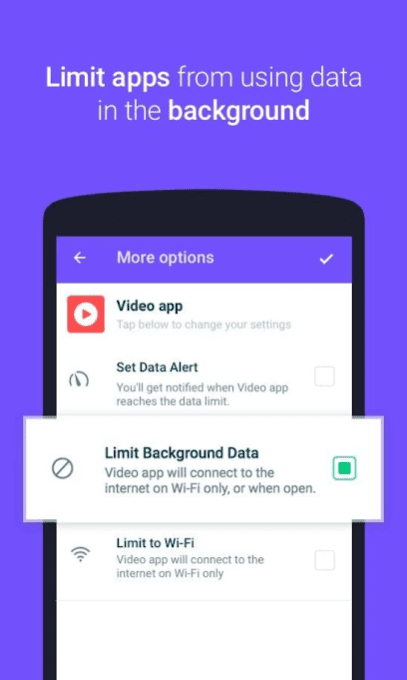 Also with it, you can block access to the network for the specified applications or prohibit downloading and updating applications via mobile data. The notification system will notify when an application has exceeded a certain amount of used traffic. Different functions of data protection and encryption will make using the Internet completely safe and anonymous. All options are on the sidebar and relate mainly to notifications. Let’s sum up: Protect Free VPN + Data Manager is made as simple as possible for a normal user and for some, such functionality may seem too simple. Perhaps the main feature of the program is the lack of advertising and any fee for access to all functions. Pleasant use! 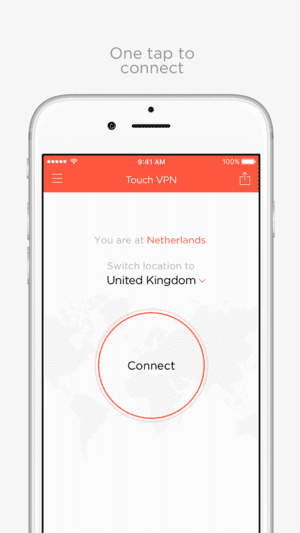 VPN Private – no matter where you are, and what site you want to visit. 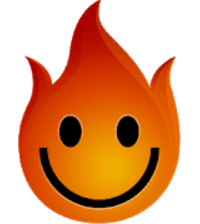 The application will hide the real IP-address and will open any page anonymously! The main goal of the program is your confidentiality. The utility provides a fast connection to sites operating from 20 countries around the world. It has a simple interface, unlimited traffic, the ability to share files and load torrents. Unblock all sites that don’t open in your country, bypass the dampers that are installed in the school or at work. And, of course, the main feature of the application is the ability to perform all operations absolutely free of charge! 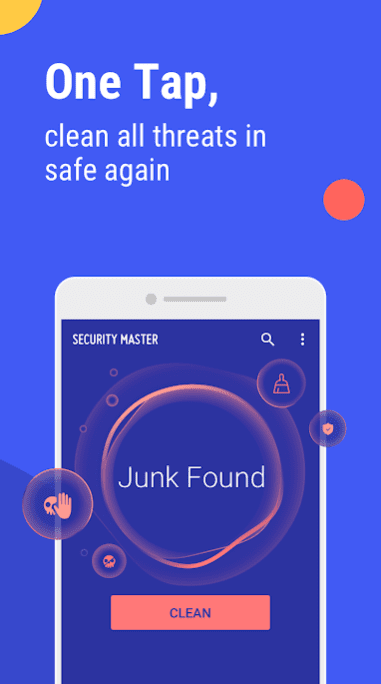 Security Master: Antivirus, VPN, AppLock, Booster is a useful application for protecting your phone and privacy from unauthorized access. Secure your device from viruses and unnecessary files. Easy to use utility that will enhance the security of your phone. Protecting the protocol extends to the transmission of data online to prevent the leakage of information during financial transactions, with private conversations and viewing stories. The application features a large button that facilitates the correct diagnosis of the most important files. It optimizes the phone, improves its performance and saves battery power. The program clears the device of unwanted files, detects viruses and frees up memory from debris and prevents overheating of the gadget. Now, you’ve learned about the benefits offered by VPN services and tried to work with one or more of the services listed above, it’s probably time to secure your protection on the Internet without compromise.